Epic Viking black metal one-man-band Draugûl from Malta is back with its new work, the second full-length album “Tales of Loot and Plunder“. This project was formed in 2012 by Hellcommander Vargblod, who is the only member of the band. 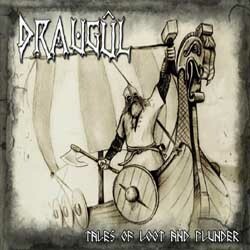 Draugûl released their debut album “The Voyager” in 2013 via the German label Pesttanz Klangschmiede, the same label that published their new album on the 28th of March 2014. In the first album the band was still trying to find its identity, with direct references to its basic influences. ”Tales of Loot and Plunder” is for sure a much more solid and personal work. Except for the obvious improvement in the production and sound, the songwriting and quality of music is much better. The album includes 11 songs with a total duration a little over 51 minutes, while the closing track is a cover on Rotting Christ’s “King of a Stellar War“. Draugûl play guitar based epic black metal, with a good balance between aggression and melody. Thankfully guitars sound now more natural, powerful and technical, while the songs move again between mid and fast tempos. The clever use of synths and folk instruments make the album much more beautiful, interesting and atmospheric. The band uses both epic raw black metal screams and clean male vocals, while the participation of many guest singers (especially the female ones) make the whole album much more interesting and complete. I need to comment the improvement of Vargblod’s clean vocals that combined with the much better and richer orchestrations, allow the band to sound more epic, melodic and “folkish”. Unlike the debut album that had also some Tolkien inspired songs, “Tales of Loot and Plunder” is a concept album totally focused in Norse thematology, dealing with Viking Raids throughout the years 793AD and 1066AD. Except for few lyrics in Swedish, all other lyrics are in English, but they are not included in the CD booklet. “Tales of Loot and Plunder” is a step forward for the band, who managed to improve technically and to present a work more complete and original. Of course there is still a long way to go in this overcrowded genre, but the signs are positive. Fans of Viking black metal, who prefer the more pure, epic, austere side of the genre, should check this band. ”Tales of Loot and Plunder” is released via Pesttanz Klangschmiede in a standard jewel-case CD edition with a 4-page booklet, illustrated by Hellcommander Vargblod himself, who did everything in this album (except for the guest vocals haha). You can follow the band’s official Facebook profile for more info and sound samples.